Newly renovated unit in the historically designated Sandcliff development in luxurious South Palm Springs! 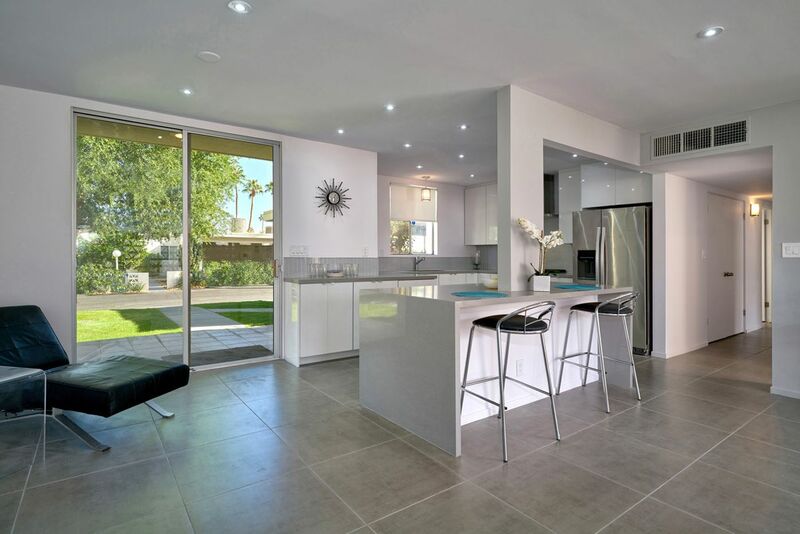 Sandcliff is a superb example of "Desert Modern" architecture and the "lifestyle" condominium complexes that became so popular throughout Palm Springs in the 1960's. The property is located on Fee Land (you own it). Take a step back in time while enjoying all the modern conveniences. This tasteful remodel spared no expense in finding the perfect balance between lifestyle, history, and luxury in this iconic "condo-home". A large private outdoor patio is accessible from every room and embraces scenic mountain views, as picturesque palm trees sway in the balmy climate. The den has a wonderful layout for a guest space with sofa bed or can be converted into a full 3rd bedroom with closet. Just a stone's throw away from the Smoke Tree Shopping Center, this perfect location gives you everything you need with ease and speed. Minutes from downtown, hiking trails, and world-class restaurants, you couldn't ask for anything more. A gorgeous pool and bar area complete the ensemble of the ideal Palm Springs lifestyle. To live-in or use as a lock & go vacation getaway, it's a win-win for all. One carport and storage space.